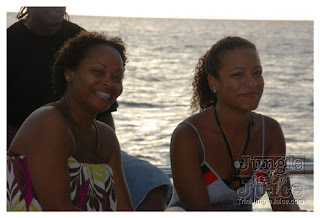 I went on a catamaran cruise with friends the Monday, after St.Lucia Jazz and Mother's Day. I met "Dr. Ram Dass" of TriniJungleJuice.com with his professional camera in tow. I was hesitant to get caught in any pictures, but Dr.Ram Dass promised that these were for his own collection. 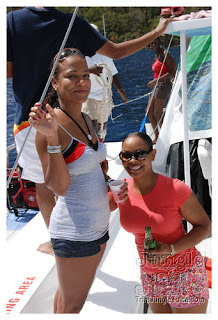 Today, a friend MSNs me this link, TriniJungle Juice: After St.Lucia Jazz Catamaran Cruise. There are plenty of pictures, a glimpse of beautiful St.Lucia, especially the coastline. Since I did not take any pictures that day which is so unusual. Thanks Dr.Ram Dass. LOL! man nyree so long i eh comment and u put that annoying word thingy just like saucy? well anyways all i wanted to say was, you know how bad i wanna be in a picture like this, in a party site??? ill even be mucho happy if its partyaccess, lol.